The Sierra de Grazalema Nature Park, declared a Biosphere Reserve by Unesco, located in the north east corner of Cadiz province and the north west corner of Malaga province, Andalucia, is of great ecological importance and extends to 51,000 Ha. The terrain is of limestone, ranging from 250 to 1600m above sea level and has the highest rainfall in the Iberian peninsula, over 2,000 litres per sq metre (over 80 inches) per year. The high rainfall has carved the limestone into caves, grotoes and gorges, the most spectacular of which is La Verde, having walls rising vertically for 400 metres. This area is also home to Andalucias largest cave system, largest of which, Hundidero-Gato being 4km long and has an entrance 60m high. On the Sierra del Pina, located in the north west corner of the park, is a forest of rare Spanish Pine trees, a species that only grows above 1000m. The rest of the forest has large areas of holm-oak woods, while cork oak, gall oak and pine groves are also to be found. Carob trees, wild olives and barberries are also to be found. In total,over 1300 plant species have been recorded here, some unique to the area. The bird life is possibly the main feature here with one of the largest nesting colonies of tawny vultures in Europe. You may also see Egyptian vulture, several species of eagle, including Golden Eagle, and goshawk. Access to 3,000Ha of the park containing the most delicate ecosystems is strictly controlled and at times (mid summer when there is a high fire risk) is closed. 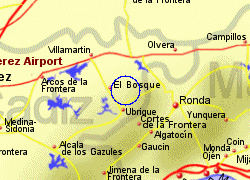 There are visitor centres at El Bosque on the north west side of the park and Cortes de la Frontera on the south easts side. 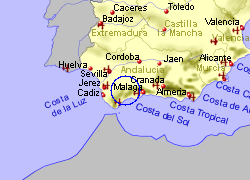 Map of the Sierra de Grazalema Park area.